The first half of the Hall of Fame ballot had some personal favorites, specifically Andre Dawson and Bert Blyleven. But things get really sticky in the second half, where you get folks like Mark McGwire, Jack Morris and the ballot's top new addition, Tim Raines. Don Mattingly: Between 1984 and 1987, Don Mattingly finished in the Top 7 in the AL MVP race four times, winning in 1985. After 1987, he drove in 100 runs in a season once, never hit more than 23 home runs, never scored 100 runs and couldn't get his slugging percentage above .477, which isn't really acceptable for a 1B, though he did hit over .300 a couple times and he won several additional Gold Gloves. Basically, that's just not a long enough Hall of Fame-type career. Want to know why the New York media is screwy? Mattingly was still getting MVP votes right at the end of his career, in years he was hitting .300-ish with middling power for bad Yankees teams. Mark McGwire: There was some discussion of this over at A List of Things Thrown Five Minutes Ago and since I defended McGwire passionately there, I may just need to cut-and-paste what I wrote there. I said, "I'd vote for McGwire. Without any hesitation. I'd have *qualms*. But no hesitation. Major league baseball made its own bed when it comes to McGwire. The sport turned its back on laws and regulations and the players took advantage. Bad players! But without 100% certainty that some people were using steroids and others weren't, I'm going with the assumption that absolutely everybody was doing something they shouldn't have been doing. And in that context, Mark McGwire was the best power hitter of his era. Period. The damage he did to the game's reputation after the fact doesn't COMPARE to the positives he and Sosa did for the game in 1998 in terms of bringing the game back. Also, McGwire hit 450-foot home runs. Every time. I don't accept that that's the result of steroid use. I would absolutely require that his HoF plaque make *some* semantically ambiguous reference to steroid use, but I'd put him in the Hall." In a later part of the comment thread, I got a bit more statistical and wrote "The goal in baseball as an offensive player is to create the maximum number of runs per at bat. No player, in the history of the game, had a higher at-bat/home run ratio than Mark McGwire. Not Bonds, not Aaron, not Ruth. And it isn't even closer. McGwire is one home run every 10.6 at bats, Ruth is every 11.8 and Bonds, in third place, is every 12.90. McGwire had 1414 RBIs in only 6187 official at bats. I don't have that stat at my disposal, but I have to assume that's one of the highest percentages of RBI/at-bats of any player in baseball history. Yes, McGwire has a .263 lifetime batting average and only 1626 hits. That stinks. Not gonna argue. The batting average was lowered by several years he was basically crippled. Granted that that probably pushed him into steroids, but you wanted to take that out of the equation. 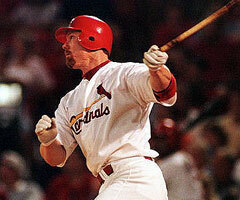 Despite the minimal number of hits, McGwire has a career OBP of .394 and a career OPS of .982. And he was the most feared hitter in baseball for a decade. Utterly dominant when healthy. Changed the way other teams planned their games. We're talking about a 12-time All-Star and, lest we forget about this because of his later years when he was lumbering, a former Gold Glove winner. For at least six or seven years, he was among the best fielding 1Bs in baseball." Yeah. That says what I want to say. Add whatever fine print you think appropriate, but put McGwire in the Hall. And put Pete Rose in the Hall. He's not on the ballot, but he belongs. Jack Morris: That 3.90 ERA isn't very good and the 254 wins are solid, but unremarkable. All you can do is judge a player in the context of the time in which he played and Jack Morris was the greatest pitcher of the 1980s. Sepinwall takes exception to my using a random 10-year designation -- i.e. the '80s -- as a principle marker for Morris' relative greatness and he argued that Morris' best years just happened to coincide with the 10 years of the '80s. And yet for me, Morris' defining moments are actually both outside of the '80s. There's that 10-inning Game 7 complete game shutout in the 1991 World Series and then he was useless for the Blue Jays in the 1992 World Series. Although the second one probably isn't a solid point in his Hall of Fame favor, Morris *did* win 21 games for the Blue Jays that season and pitched 240 innings. Because that's what Morris did. He anchored winning rotations and always gave his team a chance to win. At the point Morris stopped playing, they stopped making pitchers like Jack Morris. There was a lot of talk this postseason about whether Curt Schilling had cemented his Cooperstown credentials with his clutch performances. Sorry, but Schilling can't enter until Morris is already enshrined. That's a "Yes." Dale Murphy: Like everybody else, we had two Superstations growing up, WGN and TBS. So I had the choice of regularly watching Cubs games or regularly watching Braves games. I took the Cubs, because I HATED Dale Murphy. I'm not sure why. Murphy had a longer run of HoF caliber years than Mattingly did, to be sure. While never as good as Mattingly, between 1980 and 1987, Murphy sure looked like he was going to Cooperstown. But when Murphy fell, he didn't fall light. He fell HARD. After hitting 44 home runs in 1987, that was it. His remaining full-season batting averages were .226, .228, .245 and .252, while his power dwindled, his speed vanished and he basically fell off the map. If he'd had a Kirby Puckett career-ender of some sort in 1988, I bet he makes the Hall despite the lack of accumulated career stats, just cuz he was pretty, Christian and people liked him. Instead, those seven All-Star appearances and five Gold Gloves and an impressive Iron Man streak are just hallmarks of a solid career. Robb Nen: Since he retired, Nen has seen Jose Mesa, Troy Percival, Robert Hernandez and Billy Wagner move ahead of him on the all-time save list. None of those guys (barring a late-career charge from Wagner) are Hall-of-Famers. Neither is Nen, particularly if Goose Gossage and Smith are still on the outside. Dave Parker: If a combination of injury and drug use hadn't pretty well wrecked Parker's career between 1980 and 1984, he would have been a no-hesitation first-ballot Hall-of-Famer. At 27, he was a two-time batting champ, an MVP, a Gold Glover, an All-Star regular and one of the NL's most feared players. Those years he lost -- due self-inflicted and externally inflicted wounds -- would have been his prime and might just possibly have boosted those 2712 hits, 1493 RBIs and 339 home runs into a statistical realm in which the Pittsburgh cocaine scandal wouldn't have been enough to keep him out of Cooperstown. Tim Raines: Baseball Reference's list of 10 most comparable batters includes four Hall-of-Famers -- Lou Brock, Fred Clarke, Harry Hooper and Enos "Country" Slaughter. He was a seven-time All-Star, a former batting champ and a four-time stolen base champ (if not for Vince Coleman, he'd have had seven or eight stolen base titles, which might have boosted his credentials). He ranks fifth all-time in steals with 808 and his 2605 career hits and 1571 runs are good enough to be in the discussion as well. He had only 3 Top 10 MVP finishes and his was one of those careers that might have seemed more Hall-worthy had he retired five or six years earlier. He was always in Rickey Henderson's shadow in the '80s, but realistically, he may not have even been on the outskirts of his shadow, since Rickey was probably better in every imaginable facet. Jim Rice: In a period of 12 years, he was in the Top 5 in the AL MVP voting six times, which gives him a longer period of sustained excellence than folks like Mattingly, Parker and Murphy. I have to go back to my baseball card collection, because Rice's 1978 season always astounded me, with the 46 home runs, 139 RBIs and .600 slugging percentage. These days, that number wouldn't be all that significant, but I looked at the backs of lots and lots of baseball cards when I was little and that .600 slugging percentage stood out. Rice is one of the last offensive forces in baseball whose numbers mean what they mean, whose numbers you don't second guess or question. So if he only had 382 home runs and only 1451 RBIs, that pales in comparison to what today's hitters are doing, but Rice's 382 and 1451 mean exactly what they say. He wasn't able to play til he was 40 to pad out his career stats in the ways that voters seem to love, but he'd get my "Yes" vote. Jose Rijo: There were moments where Jose Rijo was the best pitcher in all of baseball. They weren't prolonged moment, but they often came at important times, like the 1990 World Series against the A's, when he was the MVP. Because Jose Rijo started his career with the Yankees when he was only 19, he's still only 42. I bet he could still pitch out of the bullpen for the Devil Rays. Lee Smith: First Hall of Fame voters got lucky that Lee Smith blew away Jim Reardon on the career saves list, because Lee Smith feels a bit more like a Hall-of-Famer than Jim Reardon. Now, though, voters are catching a break with Trevor Hoffman blowing away Lee Smith on the career saves list, because Trevor Hoffman feels a bit more like a Hall-of-Famer than Lee Smith. He wasn't dominant like Bruce Sutter or a multi-inning warrior like Goose Gossage, but neither of those guys had anywhere near Smith's longevity as a top-of-the-line closer. I mean, he lead the NL in saves in 1983 and led the AL in saves in 1994 and that's not the kind of thing that people do in a profession where the best often flame out hard. He got a lot of saves on a lot of bad teams and if he'd retired a couple years earlier, he'd still have held the career saves record but his career ERA would have been under 3 and that's the sort of thing that apparently matters to voters. He had a great glare and *looked* like a closer and the fans of the teams he rooted for had faith in his abilities. He just doesn't feel like a Hall-of-Famer. Todd Stottlemyre: In the early '90s, before I moved to New England and adopted the Sox, I rode my Canadian passport to rooting for the Blue Jays. Stottlemyre was a contributing part of two World Series-winning Blue Jays teams. Thanks, Todd! Alan Trammell: Going back to my Blue Jays fandom again. When I was young, it seemed like the AL East always came down to the Tigers and the Blue Jays and for that reason, I hated Alan Trammell with a passion. He always got on base or got big hits or made big defensive plays. In a different era, both Trammell and Lou Whitaker wouldn't have had any trouble shooting into the Hall. He was a regular All Star, frequently received MVP votes, picked up a pile of Gold Gloves and was the MVP of the 1984 World Series. A little power. A little speed. But his Hall candidacy is mostly about intangibles, since he lacked the flash of Ozzie Smith or Cal Ripken's iconic status. It's a "No" vote, but a close one. I'd go "No" by a mighty thin margin. If I'm voting for one early '80s Expos who didn't get the respect he deserved because he was stuck in Montreal, I'd go with Dawson this time around. If Raines stick on the ballot for a year or two, he might get better in my brain. If I got to vote, I wouldn't be one of those voters who figured that if they didn't get in Year One, they didn't deserve to get in at all.